Solar System problems, and Sun Pull app. 1. Our spherical Sun with its spherical structure and functioning would be more stable if the planetary gravitational pulls on it were basically distributed spherically. The fact that they are now distributed in one plane only, exerts destabilising pulls on the Sun. Were some planets to orbit the Sun in a plane at 90% to the present planetary orbits then this problem would be much reduced. 2. Our Earth with its spherical structure and functioning would also be more stable if gravitational pulls on it were basically distributed spherically. The chief factor going against that is our having the Moon orbiting Earth. William Gilbert before 1600 concluded that the Moon was pulling our seas and so causing tides, and there is no doubt that the Moon also pulls the land and must help encourage volcano eruptions and earthquakes and continental movement that destabilises Earth. A thin flat disc artificial moon would have little gravity and so should reduce such problems if it replaced the Moon. Earth's gravity has set its Moon's spin to equal the Moon's orbit time of 27 days (as have most other planets set their moons' spins) basically due to Moons not being homogenous spheres. 3. Both the Sun and the Earth would also be more stable if gravitational pulls on them were less from point sources, eg if the Earth's one moon was split into several smaller moons or if the Sun's few planets were split into a larger number of planets. Then the gravitational pulls on the Earth and the Sun would be less concentrated directionally. 4. 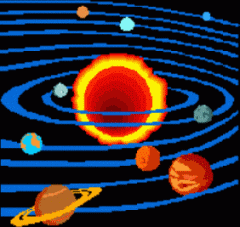 Both the Sun and the Earth would be still more stable if planets did not all have separate orbits with different orbit speeds allowing intermittent alignment conjugation of their gravity pulls. 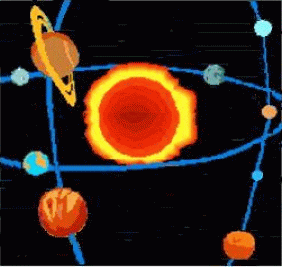 Clearly our solar system may not be quite as stable a system as many have imagined. And in particular the Sun and the Earth do have real gravitational instability problems. The relative gravitational pulls of the planets on the Sun at present are about - Mercury=0.37, Venus=1.57, Earth=1.00, Mars=0.05, Jupiter=11.75, Saturn=1.05, Uranus=0.04, Neptune=0.02. Jupiter, Venus, Saturn, Earth and Mercury exert the strongest pulls on the Sun. If the planets were in two orbits at 90% with orbit diameters near the present orbit diameters of Mars and Jupiter then their total pulls on the Sun would be about the same as now but with much reduced equatorial effect and much reduced conjugation effect. Of course asteroids, comets and moons have some additional effects. Another general solar system problem of course is the large number of rogue rocks hurtling around the solar system, many coming out of the asteroid belt because of its gravitational instabilities from the type 3 and 4 affects above. And there is the general solar radiation problem made severe periodically by increased flare activity as the Sun is affected by its gravitational instabilities. The Earth today is affected most by the Moon's gravity, though the instabilities of the Sun can and do also have significant effects on the Earth - both mostly impacting our weather system and helping to cause periodic ice ages or global warmings (and probably also helping prompt volcano eruptions and earthquakes that are more affected by moon gravity). Of course to date mankind has been able to do little or nothing about any of these solar system problems, and there are some other lesser problems also. Of course the moon's night light does have some useful effects, and even its gravity is claimed to somewhat moderate the comings and goings of ice ages by stabilising Earth's spin alignment though its pullings may well indirectly actually destabilise such to some degree. For some more on this see our section on Gravity. In our solar system it seems that a planet is more likely to retain an atmosphere if it larger, if it is further from the sun, or if it has a stronger magnetic field. So to make an Earth-size planet habitable would seem to require it to have at least an Earth-strength magnetic field for it to be in an Earth-distance or less orbit around the sun, and with a weaker magnetic field would require it to be in a greater than Earth-distance orbit around the sun. Of course it would be good to have some other planet in Earth's orbit with no moon, or to make realistic working robot gravity models of Earth with its Moon to study as discussed in our Gravity section (akin to William Gilbert's magnetic Terrella experiments). The Suns heat is produced by a process called Fusion where two light atoms like Hydrogen fuse to make a heavier atom like Helium, caused chiefly by the very strong gravity and/or extremely high pressure generated by it with the Suns mass being about 333,000 times the mass of Earth. The many physicists trying to cause Fusion using extremely high temperature alone are almost certainly wasting science time and money, as Fusion almost certainly needs extremely high gravity and/or pressure (with high temperature being mainly a byproduct of Fusion rather than a cause of Fusion). Of course technology that can generate gravity has still not yet been developed. Now our new gravity App called 'SUN PULL' can help you study or re-design the solar system to reduce solar instability, and you can try it below. This Android App loads with the 2013 solar system and takes the total gravitational pull of its planets and moons on the Sun as 100. Orbits run from the Sun, as Mercury(ME), Venus(V), Earth(E), Mars(MA), Jupiter(J), Saturn(S), Uranus(U), Neptune(N). If a planet has multiple moons then the App uses their total mass. Green bodies are active or present in the solar system, and Orange bodies are inactive or absent from the solar system. Click one or more bodies to change their status, and the App gives the new gravitational pull of planets and moons on the Sun. When the App is loaded showing 100, clicking the green Jupiter(J) gives a new pull value of 25.066 showing the contribution of Jupiter to the total gravitational pull of planets and moons on the Sun as being 74.934%. This can be done for any planet or their moons. Click green bodies to move them out of the solar system, or click orange bodies to add them to the solar system. This App should also work at least approximately for other orbital gravitational systems that involve proportionate forces and orbits. Moving both Mercury and Venus into Earth's orbit cuts the Sun Pull to 93.812, and then moving Mars into Earth's orbit makes it 94.203. Current solar system planet orbits are basically all in one plane, but this App allows modelling moving planets to orbit in two planes at 90 degrees by simply running it for the planets of each plane separately. Of course this App looks at the pull of planetary bodies on the Sun, not the more common looking at the pull of the Sun on planetary bodies - but obviously that is just action and reaction which are simply equal and opposite for this app. Do galaxy orbit speeds require Dark Matter ? Imagine a solar system where instead of one planet in each orbit there are many planets in each orbit, so that each orbit approximates a mass-ring. Would the planet orbit speeds be due only to the pull of the Sun as for the planets now ? Or should not the outer planets be subject to the pull of the Sun augmented by the pull of the inner mass-rings, so that their orbit speeds would be augmented without us having to assume any additional Dark Matter ? And might this approximate to the gravity scene in at least some galaxies ? Is there a big Ninth Planet in the outer solar system ? Some astronomers theorise that there should be a Ninth Planet about 10 times the mass of Earth in the outer solar system about 1000 times further from the Sun than Earth. The supporting evidence being offered is based on analysing periodicities in the Suns light emission and assuming them to directly related to planet orbit periodicities varying gravitational pulls on the Sun although its light emission is not simply related to such pulls. If you use the 'Sun Pull' Android App free above, by just clicking the green E in Earth's EM orbit, to switch off Earth, then you will see that Earth's gravitational pull on the Sun is about 6.424% of the pull of all the planets which is how much that pull falls. So adding a Ninth Planet 10 times Earth's mass at 1000 times Earth's distance from the Sun means its gravitatational pull on the Sun being 1/100000th of Earth's pull [1/(1000x1000/10)]. A small asteriod falling into the Sun would have a greater impact on its light production than the pull of a Ninth Planet, and some planet conjunctions may have a periodicity similar to that of its predicted orbit. So current evidence for this Ninth Planet is probabilistic and uncertain, but that is not stopping some astronomers from continuing a search for it. And of course as the planets pull on the Sun, so also do eg the 60+ moons of Jupiter pull on Jupiter. Currently little is known about the exact significance of these pulls, so for now at best some educated guesses only are possible on these issues. But at present we do not have sufficiently accurate or complete information on Jupiter and its many moons to make a useful Jupiter Pull app. And another interesting question, that somehow modern physics seems to have ignored, is does the Sun's gravitational pull on the Earth at all diminish during a lunar eclipse as light diminishes or do the pulls of Sun and Moon then perfectly add ? Does the Sun's pull maybe diminish by one billionth or less, or even increase slightly ? 1. Some less advanced civilizations may unreasonably see a possible danger in uncontrolled contact with more advanced civilizations - as in such contact saying 'We are mugs, come and mug us'. And most less advanced civilizations by definition may have technology capable of at most insubstantial contact or trade in any case. 2. Most more advanced civilizations may reasonably see an ethical issue in uncontrolled contact with less advanced civilizations - as in it subverting self-determination for the development of the less advanced civilizations. More advanced civilizations may see less advanced civilizations as having a 'right to self-determination'. "As the right of each sentient species to live in accordance with its normal cultural evolution is considered sacred, no Star Fleet personnel may interfere with the normal and healthy development of alien life and culture. Such interference includes introducing superior knowledge, strength, or technology to a world whose society is incapable of handling such advantages wisely … This directive takes precedence over any and all other considerations and carries with it the highest moral obligation." And only more advanced civilizations by definition have technology allowing substantial regular trade contact anyway. 3. These considerations would seem to favour substantial regular contact, as involving trade relations, only between more advanced civilizations. And the Earth to date has clearly not yet developed an advanced science or technology that would allow it to be invited to join an advanced-species trading club. This would chiefly need an advanced physics and well certainly it seems that physics has, for now at least, really ended - but maybe there may be some small chance of a fresh physics restart happening sometime if more rebel against current useless physics ? This is probably the chief need for any real 'alien contact'. But though there seems little sign of it now, maybe our somewhat primitive science might somehow make that big breakthrough soon ? Promising experiments need funding, as below. Vincent Wilmot 166 Freeman Street Grimsby N.E.Lincs UK DN32 7AT.